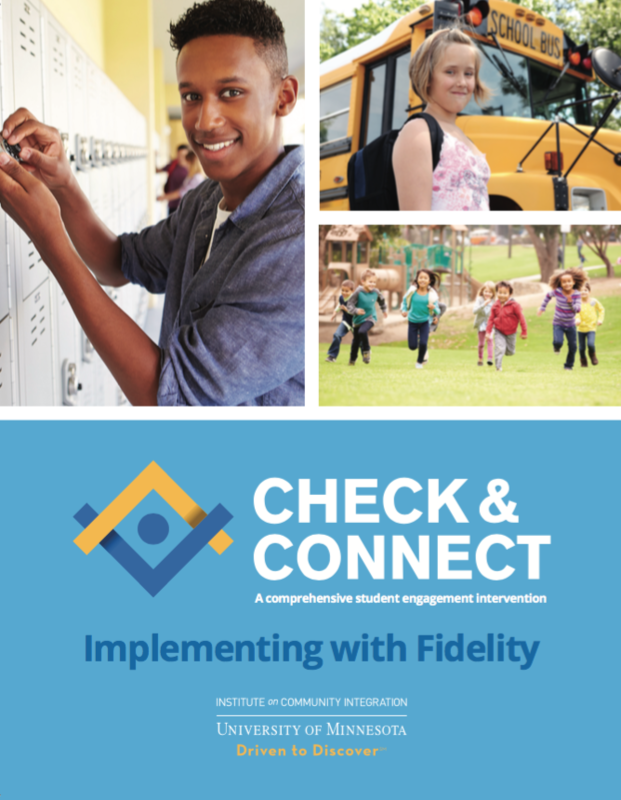 The 2012 edition of the Check & Connect manual, "Implementing with Fidelity" by Sandra L. Christenson, Karen Stout, and Angie Pohl of the University of Minnesota, is an expanded guide to the theoretical foundations, components, elements, and steps for implementing Check & Connect. Since 1990, the Check & Connect student engagement intervention has been used in K-12 schools with students showing early warning signs of disengagement from school and learning or at risk of dropping out. The 2012 edition of the manual builds on the experience and continuing research of the past two decades and incorporates new findings about the model. It presents the underlying theory and research behind Check & Connect, including the four types of student engagement (academic, behavioral, cognitive, and affective), the theory underlying their emphasis in Check & Connect, and the importance of intervening both directly with students and indirectly through enhancement of students’ home and school contexts. The manual also provides guidance on options for implementing Check & Connect with fidelity to its principles and strategies, while responding to local school and community contexts. Included are practical examples and resources, such as sample referral, intake, interview, and monitoring forms (elementary, middle, and high school); guidelines for goal setting; example interventions by engagement subtype; and more. You may download the manual's Table of Contents for information on the contents, as well as the Monitoring Form for High School Students for sample material. Payment options include credit card, purchase order, or check.To order, please mail or fax the complete Manual Order Form to: Check & Connect, Institute on Community Integration (ICI), University of Minnesota, 6 Pattee Hall, 150 Pillsbury Dr. SE, Minneapolis, MN 55455. Prices include Fed Ex Ground shipping within the continental U.S.; for other shipping options, call Check & Connect Publications at 612-625-5037 or email cconnectpub@umn.edu. Tax-exempt Minnesota organizations: Please provide copy of exemption certificate if first time ordering from ICI. Complete details are available in the order form. Although the manual may be purchased separately and may be sufficient for implementing Check & Connect at your site, training and consultation is encouraged to ensure fidelity of implementation. Participants of Check & Connect 2-day trainings receive the printed manual, a printed training binder of supplemental materials, and access to electronic implementation forms. Sites that contract for custom training also receive consultation support following their training. Finally, many university and school-based professionals have contributed to the design of and research on Check & Connect. In particular, authors of and contributors to the 2008 manual include Mary Sinclair, Camilla Lehr, Colleen Kaibel, Amy Reschly, Ann Mavis, Donna Johnson, Jean Ness, Connie Burkhart, and David Johnson. Acknowledgement also is extended to the many graduate research assistants who have served as mentors; David Evelo, a school-based coordinator on the initial project; Jane Fields, an evaluator with Minneapolis Public Schools and Check & Connect trainer; and the teachers, parents, and students with whom we have had the good fortune to work.